Sun is a clean, natural and infinite source of energy which produces enough power to sustain our needs for a long run. Use of Solar Power reduces your dependency on electricity hence saving up on your bills. Going Solar is an investment that will not only reap monetary benefits in future but will eventually help the environment too. What are the main equipment that are required to generate electricity from Solar? How many Solar Panels do I need to generate electricity? Why is a Charge Controller required? A. A charge controller regulates the charge on the batteries, providing full-power when necessary and reducing the charge when the batteries require less. This is important for maintaining the health and prolonging the life of the batteries. How many types of Charges Controllers are available? A. There are two types of charge controller that are available: 1. PWM stands for “Pulse Width Modulation” and is basically a 3 stage charging cycle type controller. Most of the DC applications uses this technique for lower power ratings; typically upto 2KVA. 2. MPPT stands for “Maximum Power Point Tracking”. This is a new type of controller that not only provides multi-stage charging but delivers more power to the batteries by comparing the PV voltage with battery voltage and thus delivering the best current to charge the. This makes them more efficient as compared to the PWM charge controller. Do I need Power Inverter? A. This is the only component of a solar energy system that is not required. However, if it is not used, you will not have 120 volts AC and will have to use battery power alone. This might be acceptable in a small RV or cabin, but not in use for normal AC appliances. What are the difference between 12,24 and 48-volt inverters? A. This refers to the Battery bank voltage. The main consideration is that at higher voltages the current is less so that you can use smaller current rated system like wires between your solar panel array and your battery bank, inverter, charge controller. Why are wire sizes so important? A. In order to obtain maximum energy transfer from your solar panels, the wires running to your equipment need to be large enough to carry the current. Also, if they are too small, it is possible they could overheat & even catch fire. What about the rest of the system? A. The wires between the Charge Controller and the Batteries can be the same size as the wires from the Solar Panels. However, all the batteries and the inverter need to be connected with long cables. The size of your battery bank and inverter will determine the minimum size and should be covered in detail in the instructions that come in the user manual with your inverter. A. Solar Panels work on the phenomenon called the Photoelectric Effect to produce electricity. Solar Panels are nothing but blocks of specially designed semiconducting material which produce a small amount of electricity when light falls on them. This small amount of electricity is produced in a large number of solar panels (Solar Arrays) to produce electricity for everyday consumption. How do Solar Panels produce electricity? What is the expected lifespan of Solar System? A. Solar PV System does not consist of any moving parts. It is not prone to any kind of damage caused due to the friction between the moving parts or any other mechanical phenomenon that causes damage to a generator or a motor. A Solar PV System can easily last from 20 to 25 years and can even work for a longer period if maintained properly. How is a Solar System better than Diesel Generator as a backup system? A. The capital cost of a Solar System is higher than a DG System; nevertheless, a DG System incurs a high fuel cost and maintenance cost. On the other hand a Solar System doesn’t require fuel and even its maintenance is very minimal and easy. Besides a Solar System is clean and environmental friendly cost effective on long run compare to DG sets. What kind of maintenance schedule needs to be followed to keep the Solar System in a healthy Condition? A. A Solar System requires very minimal maintenance and is easy to maintain. Regular cleaning of the Solar panels should be ensured so that the system works at its full efficiency and occasional checks should be done to ensure that there is no shading over the Solar panel. The other components of the system, except the Solar panels, have to be kept in a shaded area. These steps help in prolonging life of Solar System. Which are the equipment other than the Solar panel that are required in the Solar system? A. The Solar Panel in the system help produce electricity while other components needed to convert and manage the power to the load. The electricity produced by the panel is in D.C. form and have to be converted into A.C. form to be able to be used by the consumer. A proper and safe flow of the electricity needs to be ensured so that no damage is done to the appliances. It is to ensure better reliability of the system, the other components are required. Is the power production affected on an overcast day? A. A Solar System doesn’t require direct sunlight to work, though direct sunlight gives the maximum efficiency. The system continues to work even during the overcast conditions but the efficiencies get reduced. The efficiency generally reduces to 70% during an overcast day. In India where more than 300 sunny days are available in most of the places, overcast conditions are not a major concern in India. What is the required investment for a Solar Rooftop Solution? A. The cost of a Solar Setup depends on factors such as the connected load, type and quality of the components used in the system, total available roof area etc. As per a rough estimate, grid connected solar PV System with Grade A manufacturer’s components costs around Rs. 65,000 per KW while a battery connected system costs around Rs. 1.00 Lacs per KW. How much time will it take to break even if money is invested in a Solar Rooftop Setup? A. In a Solar System, the major investment is its installation. It has a minimal maintenance cost and no fuel cost. A 5 KW Solar PV System has average pay back period of approximately 4 to 5 years. The life span of a solar System is as high as 20 to 25 years as a result 70 to 75% power produced by it may be considered as the free electricity. How much Roof Top Area is required to install a Solar PV System? A. It is mandatory for a Solar System to have a shade free area all the time of the day. The most important factor on which the area of a Solar System depends is the Panel Efficiency. Generally, a Solar Panel with 15% efficiency requires 100 Sq. Ft. of shade free roof area. Another factor is the weight of the Solar Panels that may put pressure on the roof of the building. For old and poorly built construction the Panels have to be scattered in a larger area for it to withstand the weights. Does the ambient temperature affect the efficiency of a Solar PV System? A. Counterintuitive to the belief among the people, an increase in the ambient temperature around the Solar PV System results in decrease in efficiency of the system. It is to be noted here that though PV Systems work on the energy from the sun, they work on sun’s light energy and not on its heat energy. But the increase in temperature may result in lesser output voltage produced by the system which in turn results in the decreased efficiency of the system. How does shading affect the performance of a Solar PV System? A. Shading has a very large impact on the performance of a Solar PV System. Since a Solar Panel is made of large number of Solar Cells, shading on a small part of it can have a adverse effect as the energy produced by the rest of the Solar Panel may be consumed by the part which is under the shade. Why should I setup a Solar System at my premises? A. Setting up a Solar PV System at your premises gives you a chance to be self-sustainable in your power consumption as dependency on the grid to supply you the required electricity gets reduced. 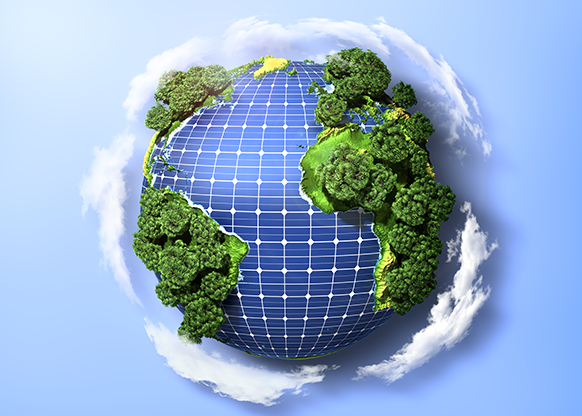 A Solar System is a clean and environment friendly way for Power Generation. You can sell electricity to the already power deficit grid in the country thereby playing a role to fulfil the electricity requirement of the country. How much rooftop space is required? A. Most of the solar panels are installed on rooftop. However, in some cases they can also be mounted on ground. You would need a shadow-free area of approx. 10sqmtrs or 100 Sq. ft. to accommodate 1kWp solar panels. Please make sure that the area gets maximum sun light. Your solar installer will select the best angle for solar panels. Solar panels are designed to absorb the sun rays and generate electricity. They are also known as PV or photovoltaic modules as they don’t need anything beyond sunlight to produce electricity as DC. Solar panels, thus, can easily replace fossil fuels that cause unnecessary pollution. These panels supply clean and renewable energy that comes directly from sun, reduce the carbon footprint, and is not harmful to the environment. The cost of solar panels has considerably reduced in the past few years. The reason is simple. More and more people understand the benefits that it has in store. At Livfast, we value quality and provide the best solar panels at a very affordable price. Also, an investment in solar panels is very sound as compared to the grid system, it is cheaper and the whole cost can be recovered in a short time. In fact, after a certain period of time, if you choose the right installation service, you can actually start earning profit on this investment. A. Livfast gives 25 years of warranty on panels and assures a great performance, not just functionality.